It’s February, which means Valentine’s Day is quickly approaching. For some people, Valentine’s Day is about flowers, jewelry, grand romantic gestures. For me, it’s about chocolate. Oh, don’t get me wrong. I like flowers, jewelry and grand romantic gestures. It’s just that I love chocolate. In our house, we celebrate Valentine’s Day with dinner at our favorite fancy restaurant… on any day but Valentine’s Day. Dining out on Valentine’s Day means huge crowds, limited menus, and poor service, all of which I prefer to avoid. That means that most years on the actual day of Valentine’s Day, I’m cooking dinner for the two of us. That counts as a grand romantic gesture, right? If you’re cooking dinner for your loved one on Valentine’s Day too, you’re going to need to make note of this recipe. 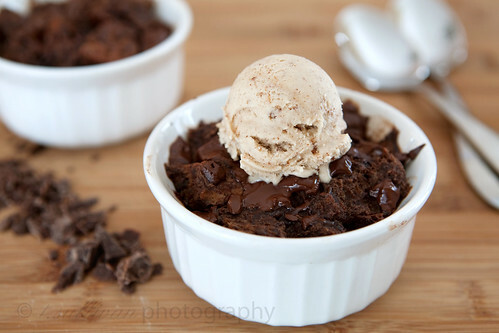 Rich, decadent chocolate bread pudding. Seriously easy and you can make it a few hours ahead of time to avoid a mad rush to throw dessert together after your romantic meal. There’s no butter or heavy cream either, so you don’t have to feel guilty about celebrating your love (of chocolate). And best of all, it makes individual servings so you won’t have to share your chocolate with anyone else. What, I’m the only one who doesn’t share chocolate? Hawaiian or Challah bread are recommended, but really any slightly sweet bread should work just fine. Avoid chopping the chocolate too fine so that you’ll have some chunks left after you bake it. I used 70% Scharffen Berger chocolate for a dark chocolate bread pudding, but you can really use whatever you have on hand – including chocolate chips (2 ounces is about 1/4 of a cup). Combine milk, sugar, cocoa, Irish cream, vanilla, cinnamon and egg in a medium bowl. Whisk until thoroughly combined. Add toasted bread cubes and toss until coated. Cover with plastic wrap and refrigerate for at least 30 minutes or up to 4 hours. Preheat oven to 325°F. Coat the inside of two 7-ounce ramekins with cooking spray. Divide half of the chilled bread mixture evenly between the two ramekins. Top with half of the chopped chocolate. Divide the remaining half of the bread mixture between the ramekins, then top with the remaining chocolate. Serve warm, topped with cinnamon ice cream or whipped cream. What if I don’t want to share? Ha! With all the baking I do, I have never made bread pudding. This looks fabulous! This looks yummy! I’m not normally enticed by bread pudding, but this looks promising. do you think soy or rice milk would work out? Soy milk works great for baking, I dont see why rice milk wouldn’t work too. Use chocolate soy or rice milk for extra chocolate flavor. These look great! Did you get inspired by Cook’s Illustrated’s bread pudding article? Oooh I think I have found my V-day dessert! We, too, prefer to cook up a storm rather than brave the restaurants on V-day…instead we choose something French and complex and have fun playing chef and sous-chef. This year it’s Michel Roux’s Chateaubriand with brioche crust. I have been crusing around for dessert ideas, and this one really interested me…then to find out it’s relatively light, too?! Clearly this is the one for me. This sounds fantastic. Love the individual sized ramekins, too. bread pudding? meh. it’s okay in a pinch. Well I couldn’t wait until Valentine’s Day, I made it last weekend and I can confirm that’s it’s to die for! Even my boyfriend, who is not keen on bread pudding and was therefore unexcited to try this, found it devastatingly delicious! I omitted the cinnamon as we used cinnamon-swirl challah bread. SO yum. That looks so, so good. I will keep checking your site – Bailey’s and chocolate are two of my favorite things, too! I am making this for the second time in a week :) It is so good and chocolatey, and not so terrible for you. So easy, and turned out fantastic the first time. We used vanilla ice cream because I couldn’t find cinnamon in our stores here in MI. This time I am going to drizzle caramel over the ice cream and pudding, and serve it to dinner guests for dessert. Lets hope they like it as much as my husband and I do! P.S. I’m not sure I’ve seen Cinnamon Ice Cream (never really looked for it), but it sounds delicious! Where do you get yours? The cinnamon ice cream I used is homemade, though I’m sure they probably sell something similar in stores. The recipe is in this post if you want to try it!